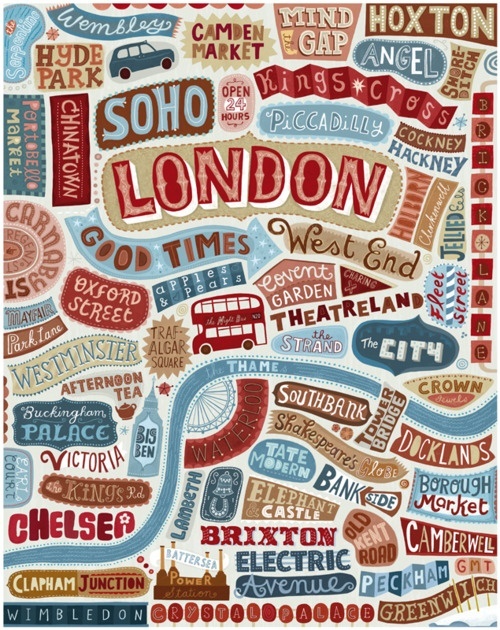 La Dolce Vita: London Calling! This weekend, I came to the realization that Fabian and I will be embarking on our London vacation in less than three weeks. Typically, I have planned every one of our vacations rather meticulously, creating detailed itineraries that ensure we squeeze in as much as we can while leaving a little room for relaxing. Lately, I have been so busy with work (thankfully! ), that I haven't had a waking moment to really think about the vacation. We also booked this on a whim a few weeks ago rather than booking several months in advance like we have for our other big trips. Needless to say, I need to do some planning! Luckily, we have been to London before and have seen most of the big attractions, though you could spend a full year in London and still not see it all. This time around, we'd like to do a handful of touristy things, but really just want to relax, eat some great food, get some inspiration, and maybe squeeze in a little shopping. We'll be staying in Westminster, so we'll be pretty close to everything. I'd love any recommendations you might have for sights to see, things to do, places to eat and so on! As I mentioned before, we spent a week in London in 2009-- time flies!-- and have seen a lot of the big sights, but I'm wondering about some of the things we missed the last time we were there. Do you recommend visiting Portobello Market in Notting Hill on a Sunday afternoon? How about the V&A museum? We have been to Buckingham Palace and Kensington Palace, but didn't go inside last time. Is it worth it? How about the London eye? We are also toying with the idea of taking the train to Paris early one morning, spending a full day there, then taking the last train back to London that evening. The last time we were in Paris was in December of 2006 and we'd love to experience it, during warmer weather, even if only for one day. Any tips for a one day itinerary in the City of Lights? Go to portobello on Friday, less crowded than sat and sun a lot of shops close depending...if it interests you book to see Buckingham palace as its only open for a short season over summer and the option isn't always there. Plus remember to walk around bc London has lots of little things along the way and unless you run around or go crosstown the tube is best voided. Hope you have a great time! This site is plenty of Paris ideas! Ps London eye isn't really worth it bc queues are soooo long....book dinner at the oxo tower and have an amazing view while dining instead and if you go to Paris on Eurostar remember to pack super light and buy a museum pass as the queues in Paris are outrageous so take a taxi to le Maria's and walk along the seon towards muses D'orsay and all the things in between should give you a great dose of the city! Day trip to Hampton Court is easy by train and so very worth it. It's great fun taking the train to Paris for a day, you must do it! Currently planning a move to London and I've discovered the charm of the village feel London can have. Yes to Portobello Market and a little stroll around charming Notting Hill. Primrose Hill is also a great neighborhood to spend a weekend day like a local between cafes and Regent's Park. Hampstead/Hampstead Heath is also lovely in North London - great shops, bookstores and restaurants and a huge open prairie with views over Central London. Check out The Holly Bush in Hampstead if you want the quintessential London pub in fantastic surroundings. Have fun! Ahhh London is awesome. We were there in July. I would highly recommend the V&A museum, if for nothing else then to spend an hour staring at their fantastic jewelry collection. It's so worth it. I also liked the market in Greenwich much better then the Portobello, which felt very commercial. How about downloading Gwyeneths's city app for London? Go to her goop newsletter and she has it there. Have fun and post lots of,pics of your trip! I recommend you the Royal Academy of Arts( Picadilly Circus) as well, appart from the exhibitions, the building its beautiful. Just in front of the Royal Academy you can find Fortnum & Mason..(dont know if you have been tere before) if no, you definitely should ! Its one of my favourites shops in London. You can have a charming afternoon tea there but better if you book before, you can do it on the website. About restaurants: Scott's in Mayfair, lovely seafood!! If you are going to Hyde Park dont forget to visit the Serpentine Gallery, this year's pavillion its beautiful ! Hope you'll have a great time in London! PS I think my next post itll be about Fortnum and Mason , just in case you want to know more about it. Make sure you go to the Breakfast Club (arrive early - it gets busy!) near Oxford st (http://www.thebreakfastclubcafes.com/locations/soho), I'm told Roti Chai near marble arch is an excellent Indian. Ozone coffee is definitely worth a trip to, for breakfast. Afternoon Tea at the Charlotte Street Hotel or the Oxo tower (Harvey Nichs). The Creperie of Hampstead and a film at the Queen of Hoxton (rooftopfilmclub.com). Burger and Lobster and Ciccetti are good for tea! Just wanted to let you know I'm sending you an email with some London tips!! Ye Olde Cheshire Cheese - pub in the City of London - not far from St Paul's Cathedral and eat at any of the Ottolenghi restaurants, including Nopi considered to be one of the best in London. Have a great time in my city! V&A is a must! They are doing an exhibit on Vivien Leigh. I could swoon over her for days! Also, my number one foodie spot is Borough Market on Friday/Saturday. I presume you are coming to London for Decorex International Design Show? If not try to be as it is amazing. I'm a designer in London so if you want a tips or even fancy meeting up so I can point you in the right direction I would love to help out.